There are countless photographers within the blogosphere. Happily, I follow the best of the best. One such ‘best’ is Mr. Spilled Ink Guy over at Refrigerator Magnate. He paints, he photographs, he modifies paintings and photographs, he draws, he slices, he dices, and he quotes movies! Well, I’m not sure about his slicing and dicing capabilities, but I’m comfortable enough to bet he could do both brilliantly. The ride to school yesterday morning was a wet one. With camera in hand, I thought about SIG and his ‘wet plate’ technique. I haven’t a clue what ‘wet plate’ means, but SIG and the ‘wet plate’ technique are the inspirations behind this photo. If you are not familiar with SIG and his creations, I strongly encourage you to pay him a visit. I assure you, his ‘wet plate’ technique is nothing like my ‘wet windshield’. Your photo looks just like my window as I take a peep outside. Kinda day to curl up with a good book. ‘Tis the season for cool rainy days. Aaaaaaah. Too funny, Lenore! I love that you referenced SIG’s wet plate technique. Maybe you both should combine the wet plate and wet windshield! Oh my goodness, Ms. D! Thank you so very much for this! I’m flattered… I’m honored… I… I can tell this is going to go to my head in a major way! You are far, far to kind!!! And your photo is beautiful! Isn’t it incredible what water can do / the effects it creates? I love shots like this… so moody and atmospheric… not nearly as easy as it looks, either. There’s definitely a trick to balancing the right amount of depth of field – and you’ve done a masterful job of it here, Ms. D! It’s true – the depth and field. I took several pictures. 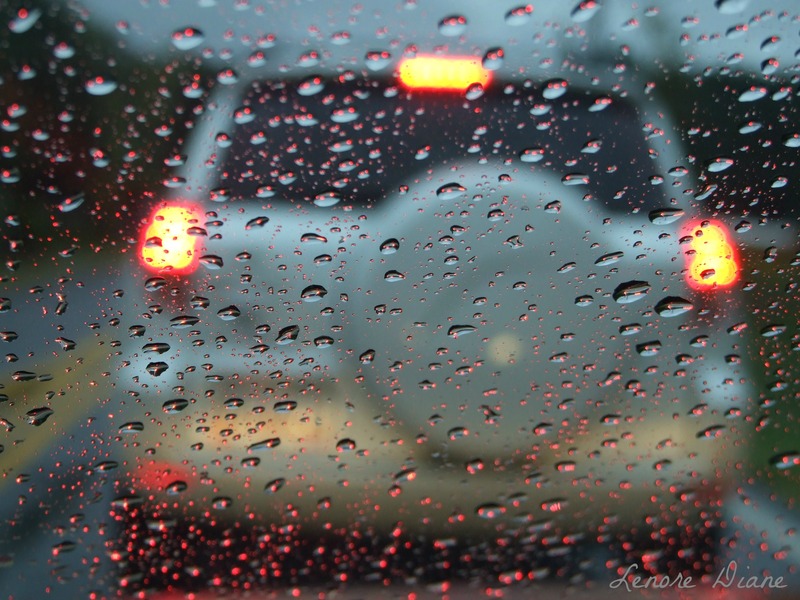 The car in front of me had to be close enough to allow the raindrops to be in focus. (I am only ‘so’ talented with working my camera and the features.) Also, the color of the car mattered. Dark colored cars did not work well. I thought capturing a car moving towards me in the distance would add to the effect – but it only took away from the effect. Yes, this was a fun shot to take and review. It will go down as one of my favorites. The only modification I did to the photo was adding my name, which pleases me, too. Glad you liked it, SIG. I really do admire your work.